Check Out Our New 10 Line Football Scratch Off Cards! 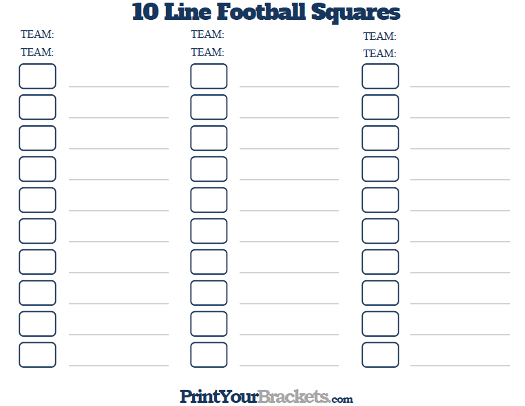 Below you will find our printable 10 Line Football Squares. This pool is a variant of the normal 100 Football Square Grid. The print-out below allows you to run the pool 3 different times on one page. Alternatively you can print a single 10 line game here. This is a quick and easy pool that works great for a small number of people. To run this pool, have the participants write their name on the line or lines of their choice. Once the 10 lines are filled up you will randomly draw the numbers 0-9 placing them in the boxes on the grid. 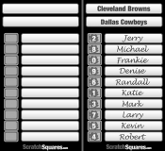 To determine the winners you will add both team's scores together and use the last digit of the total. Full explanation of the rules can be found below. The number of winners on this pool is the same as the other football square games. There should be a winner at the end of the 1st, 2nd, and 3rd quarters and a 4th winner at the end of the game. Since each person has only one winning number instead of two, as in your typical 100 Square Grid game. You will add the two team's scores together, then use the last digit from that number. Example: At the end of the first quarter Cleveland has 14 and Denver has 7 the person with their name beside the square with the number 1 would win(14 + 7 = 21, last digit of 21 is 1).